May 22, 23, 24, 25 & 26, 1984. JP wrote “Pepys Diary is one of the wonders of the English literature. This delightful play gives us one day in 1669 as Samuel Pepys, patriotic Englishman, secretary to the Navy, tireless worker, lover of music and alas, lover of beautiful women – might have spent it. Here we have a completely rounded, very human character, very aware of the weakness of the State, his King and himself. The women are charming and the episode with Charles ll is full of colour, humour and captures the flavour of the ‘merry Monarch’. “About this play; In this production we welcome some talented young newcomers to the company – Clare Readman, Gillian Robertson, Christopher Naylor, David Davison and Martin Cramp. The strength of any society in the long term lies with the young up and coming members and we are always happy when young people join us. Robin Lee, after taking several character parts with the company is playing Samuel Pepys, his first leading rôle with Wick. As Samuel Pepys is one of his heroes, he has entered into the part with great enthusiasm. We are also pleased that Hilary Wiltshire is back on the Barn Stage in a major rôle. Many of you may remember her Desdemona in Othello, in 1975. And David Creedon makes one of his all too rare appearances as Charles ll; David last acted with Wick in 1980 as Tony Lumkin in She Stoops to Conquer. REHEARSALS are in full swing for Wick Theatre Company’s next production, the comedy And So To Bed. This historical romp, set in the wild days of the 1660s, is being staged at the Barn Theatre, Southwick from May 22 – 26. David Creedon makes a return to the company after a four year absence in the leading role of Charles ll. The other plum role, that of Samuel Pepys, falls to Robin Lee. Pat Moss has a busier time than most in the pre-production preparations. She is combining learning her lines for the part of Mrs Pierce, with making the costumes for the 16 strong cast. Authenticity in the costumes of period plays is an all important factor, although combined with the cost of hiring wigs it can make it an expensive venture. Which is why Wick will be banking on five sell-out performances to recoup their costs. Husband and wife team Jean and George Porter are directing and producing the play. HURRY and you will be able to get one of the few remaining seats for a right royal romp at Southwick’s Barn Theatre. The there is set for the last two nights [Friday and Saturday] of Wock Theatre Company’s production of And So To Bed by J. B. Fagan. The historical billed as a saucy period piece, is set in the era of Charles ll and Samual Pepys, and is packed full of voluptuous women and plenty of wit. Husband and wife team Jean and George Porter are directing and producing the play. Making sweet music are, left to right, Martin Cramp, as William Caesar,Robin Lee, alias Samuel Pepys, Hilary Wiltshire as Mrs Knight, and Miranda Bowen in the part of Mrs Pepys. Text Header: Colourful day in diary! Despite a weak storyline Wick Theatre Company’s production of And So To Bed was far from disappointing. With colour, humour, music and good acting it contained plenty to entertain and was indeed a right royal romp. The action revolved around a day in the life of diarist and musician Samuel Pepys, whose love of women gets him into a decidedly sticky situation. Robin Lee, in his first leading rôle with Wick, makes an excellent Pepys, with the ability and confidence of a seasoned player. The two main women in his life on this particular day in 1669 were his beautiful, but suspicious wife and Mrs. Knight, whose delightful singing voice is only one of her attractions to him. Hilary Wiltshire excelled in the part of Mrs. Knight, and Miranda Bowen gives a sparkling performance as Mrs. Pepys. David Creedon, as King Charles ll – Mrs. Knight’s other admirer, completed the leading quartet. Other promising performances included Neil Shephard as a colourful Pelham Humprey, Pat Moss as Mrs. Pierce, Margaret Faggetter as Mrs. Knepp, Sally Bacon as Julia and David Davison as Pelling. Double praise must go to Pat Moss, who also designed and made the excellent costumes. J. B. Fagan’s play may not go down as a historical masterpiece, but Wick’s lively and colourful interpretation gave the audience at the Barn Theatre and evening of entertainment. A REVIVAL well worth reviving is J. 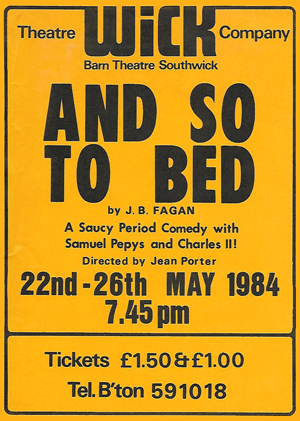 B. Fagan’s And So To Bed which Wick Theatre Company is doing at the Barn Theatre, Southwick. First presented over 50 years ago and associated with Yvonne Arnaud, this well filled day in the life of Samuel Pepys is a sheer joy. The colourful Restoration characters are well interpreted under the direction of Jean Porter. Robin Lee, in his first major rôle for the company is suitably lascivious Samuel Pepys. As his long suffering wife – but not suffering in silence – Miranda Bowen is by turns angry and contrite. The ladies in his life are distinctive and admirably contrasted characterisations by Hilary Wiltshire, who sings prettily, Pat Moss, who designed and made the costumes, and Margaret Faggetter. Neil Shephard stands out as the pwecious Pelham Humfry and David Creedon is an all-conquering Charles ll. Patrick Johnson has composed original music for this production which he plays on the harpsichord with Margaret Ockenden and Lara Bowen on flageolet and recorder. It really is a delight throughout. It ends on Friday this week.